LeGarrette Blount, five days after getting cut by the Steelers, scored a goal-line touchdown for the Patriots today, and celebrated with a dance used by one of his former teammates, Antonio Brown. Was the celebration trolling the team that cut him, or an homage to Brown? Blount says homage. 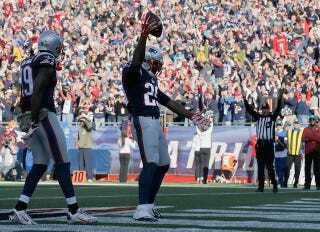 Blount had a fine return to New England, with 78 rushing yards on 12 carries, and two scores for the day. He reportedly wasn't as friendly to Ndamukong Suh, though.